This article analyses Ukrainian women migrants’ strategies for constructing the concept of home during their long-term migration projects in Italy. Specifically, this article examines the symbolic resources through which the migrants construct the concept of the home as their own, as well as the combination of different homes in the context of transnational migration. It further asks if women migrants always see their home through the dichotomy of physical and symbolic meanings and how the conflict between homes in different countries is resolved. 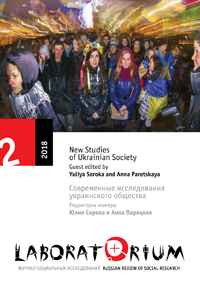 The article is based on the analysis of 60 semistructured interviews conducted both in Italy and Ukraine with Ukrainian women migrants and migration experts. The article shows how, depending on the type of migration project, migrants’ personal trajectories are related to their understanding of their private domain and its realization in time and space. Three models of home are formulated: the recreated home, the divided home, and the lost home. The second model—the divided home— turns out to be the most common. The majority of migrants from Ukraine who came to Italy in the early 2000s tend to combine the social contexts of both countries. They invest in the receiving country and continue to maintain close social relations with their country of origin, creating different concepts of home and narrativizing them depending on their own migration trajectory. Despite the fact that these are long-term (more than 15 years) migrations that entail a radical transformation of their social ties and statuses, most women are not ready to weaken their ties with Ukraine. On the contrary, migrants invest very actively in their country of origin, rather than in Italy, partly due to their age and low assessment of their personal social capital. Moving through space, these women are also moving in time, due to the differences in cultures and their social roles in both countries. Migration for many women is also a way of distancing from or avoiding conflict with the traditional social order in Ukraine: for example, migration to Italy is often a way to leave a nonfunctional family (home) without severing the relationship legally. For many migrants the conceptualization of the place as their own is closely related to the Ukrainian national project. Odynets, Svitlana. 2018. “Home Without Walls, Walls Without Home: Constructing Physical and Symbolic Transnational Locations in Ukrainian Women’s Migration to Italy”. Laboratorium: Russian Review of Social Research 10 (2), 34-51. http://soclabo.org/index.php/laboratorium/article/view/701.